The ultimate vegan guide is here! 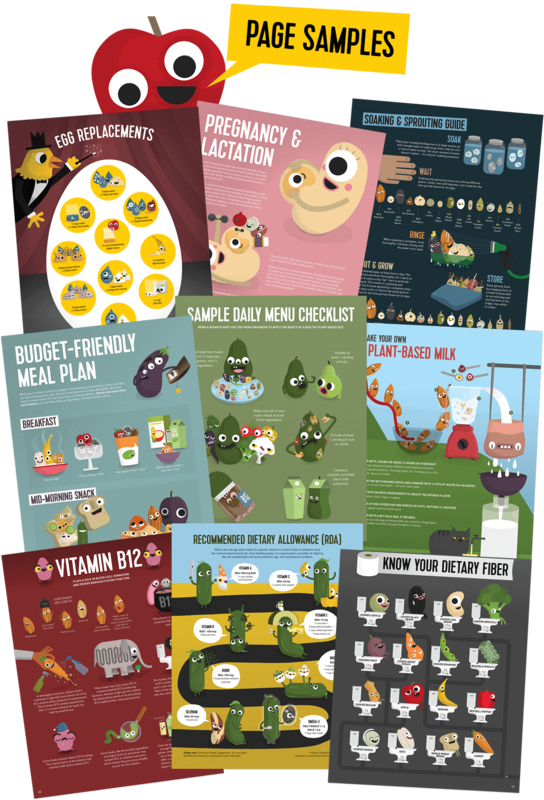 YOUR ILLUSTRATED BOOK TO THE SIMPLE HAPPY PLANT-BASED LIFESTYLE! spreading far beyond the vegan and vegetarian communities. The solution: THE SIMPLE HAPPY KITCHEN VEGAN GUIDE BOOK! This illustrated guide is packed with humorous and engaging illustrations designed to deliver all the information you and your family need to enjoy this lifestyle. Join Pedro Almondovar (a roasted almond) as he takes you through the wonderful world of plant-based nutrition, helping you take the first steps to a better, healthier, nutrient-filled, compassionate lifestyle that is also better for the environment. This plant-based guide book takes boring, hard to understand research, that can sometimes feel overwhelming and breaks it down using cheerful visuals. All information in the book clinically proved. Why go plant-based? • Why is it good for you? • How to use the vegan guide? • How to understand the nutrition facts label? • Building a healthy shopping list • Guides for spices, oils, leafy greens, legumes and grains • Benefits of soaking and sprouting • Substitutes and plant-based milks • Planning your meals • Cooking and storing hacks • Guide for protein, iron, calcium, vitamins and minerals • Simple ways to increase minerals absorption • Making food fun for kids • Vegan lifestyle with kids • Cruelty-free shopping guide • Fun facts about animals • Checklists for going vegan • Easy to make meals • Tons of tips and ideas • And much more! Simple Happy Kitchen vegan guide is not a diet or cooking book! It is the first book of its kind, meant to help guide readers and improve their diets and their children health. Instead of charts, numbers and warnings, this plant-based guide uses a visual language everyone can enjoy and understand, with positivity, humor and fun. ENJOY THE SIMPLE HAPPY KITCHEN VEGAN GUIDE BOOK! Please note: Simple Happy Kitchen does not provide any nutritional, medical or health advice. You should always consult with your doctor or nutritionist.